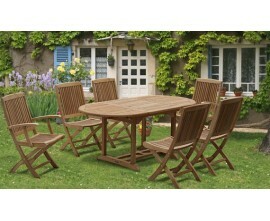 These teak extending tables are a practical alfresco dining solution for your garden or patio. 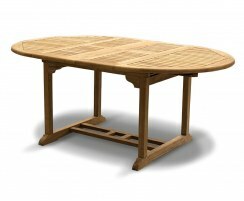 Our expandable outdoor tables are crafted from sustainable teak hardwood full of self-protective oils meaning they're delightfully low-maintenance and easy to care for. 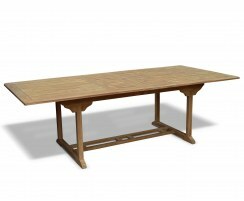 These extending garden tables will be delivered to you fully assembled so you can enjoy them right away. 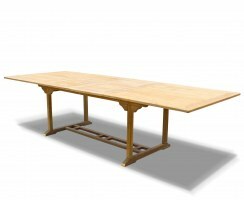 We have a range of teak extending tables to suit your every need – order today! 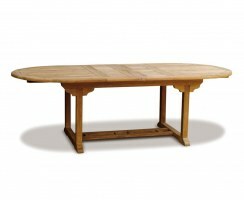 These teak extending tables are the ideal option for bigger families and extra guests at dinner parties and summer BBQs. 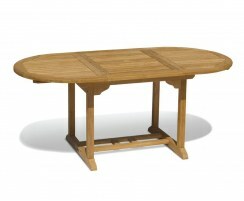 These wooden expandable outdoor tables can be left outdoors all year round whilst requiring only minimal maintenance – occasional cleaning is all that's needed to keep these extending garden tables in tip-top condition. We have single and double-leaf varieties to suit your purpose. 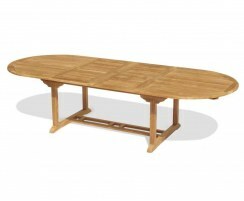 View our selection of teak extending tables and order online today.